Jesse Davidson was born in London, Ontario, Canada in 1980. He was one of three sons born to John and Sherene Davidson – Tyler is the eldest and Tim is the youngest. When he was six years old, Jesse was diagnosed with Duchenne muscular dystrophy. As a youngster in grade school Jesse was both a Beaver and a Cub. At a very young age Jesse showed a strong interest in the culinary arts. Every aspect of food from its nutritional value and preparation to its presentation remained a life-long interest. Jesse began to use an electric scooter while he was in public school. Losing his ability to walk didn’t hamper Jesse’s love of sports. A Montreal Canadiens hockey fan and a hard working student, Jesse helped organize school house league sports and served as a referee for volleyball and a timekeeper/scorekeeper in basketball. Jesse was proud to win his public school’s citizenship award. In grade school and high school Jesse sang in the choir and his academic standing ranked him among his school’s high achievers. Jesse’s interest in hockey saw him at home games of the London Knights, winners of the 2005 Memorial Cup, emblematic of junior hockey supremacy in Canada. Jesse’s interest in business and how commerce works led to his joining Junior Achievement. JA rapidly became one of Jesse’s great interests in high school. He went on to become JA’s top salesman and President of his group’s company which manufactured and marketed bean bags that can be heated in a microwave and used to provide soothing comfort. It was at the age of 15 and in grade 10 that Jesse became known across Canada for his courage and determination through a charity which quickly became known as Jesse’s Journey. Jesse’s father John – who was 49-years old at the time – pushed Jesse in his wheelchair 3300 kilometres across Ontario – in a fundraiser which generated $1.5M to fund research into Duchenne muscular dystrophy. During their trek across Ontario, Jesse had an opportunity to see things like 800-year-old Indian pictographs carved in the rock face at Lake Nipigon in Northern Ontario. When Jesse returned home in the fall of 1995 he found himself surrounded by the 48th Highlanders regimental band at centre ice at Maple Leaf Gardens. The National Hockey League’s Toronto Maple Leafs asked Jesse to drop the ceremonial puck on the season’s opening night. In 1997 Jesse met Her Majesty Queen Elizabeth II and assisted the Queen during a tree planting ceremony in London. Jesse has visited the House of Commons in Ottawa where he received a standing ovation from all members of Parliament. On the same day Jesse met with Canada’s Prime Minister. Jesse received many awards and tributes. He was named an Ontario Community Newspaper Association Junior Citizen of the Year and was among those named to the mayor’s honours list. The London youngster whose name has become synonymous with Duchenne muscular dystrophy research and who spent 124 days crossing Ontario in his wheelchair was named to the Order of Ontario in 1996. In 1998 Jesse and his mother Sherene along with Journey volunteer Mario Chioini flew to Paris, France to assist the French Association le Dystrophe Musculaire with their 30 hour telethon – not an easy task for someone in a wheelchair. The telethon generated $116,000,000. Jesse capped his journey to France by visiting and going up one of the world’s great landmarks, the Eiffel Tower. Jesse was a champion for people with disabilities of any kind. After three years at Fanshawe College, Jesse graduated with a diploma in hotel and restaurant management in 2001 and worked two days a week for Heritage London in event planning. Jesse was also honoured to receive a Distinguished Alumni award from Fanshawe College. In 2003 Jesse took a giant step forward when he moved into his own apartment. Jesse’s mom and dad would spend time each week at Jesse’s home while his helpers were there five nights of the week. Jesse looked after his own banking, bill paying, grocery shopping, hired his own attendants and arranged transportation to and from work. While Jesse worked on a number of other community projects he also served as a volunteer with Jesse’s Journey making thank you calls, recording both radio and television commercials for the journey and making personal appearances at special events. 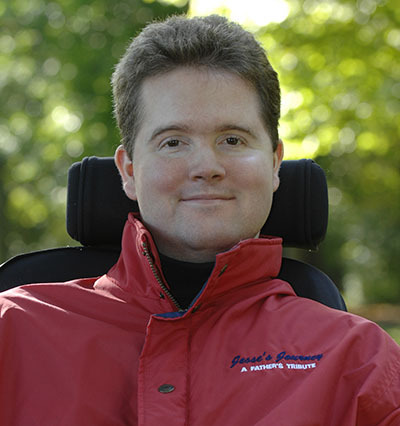 Jesse Davidson lost his battle with Duchenne muscular dystrophy November 6, 2009 at the age of 29.